2002 G.I. Joe 10-Piece “Party Lights” Set Features “Real Action Detail” to Light Up Your Holidays! Show us the Joe-Light! 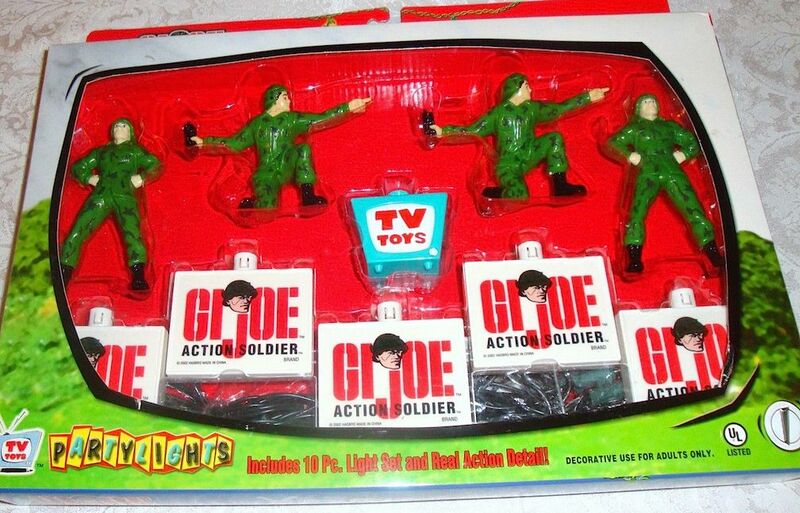 This 2002 set of GIjOE-themed string-lights from “Brain Wave” was officially licensed by Hasbro and includes 4 soldiers, 5 logos, and 1 mini television. (Photo: ebay) Click to enlarge. If you need to expand your string-lights or only wanted one of each, they’re also available in basic 2-packs (w/no strings or bulbs). Simply snap them together over any existing string-light and you’re good to go, Joe. (Photo: ebay) Click to enlarge. 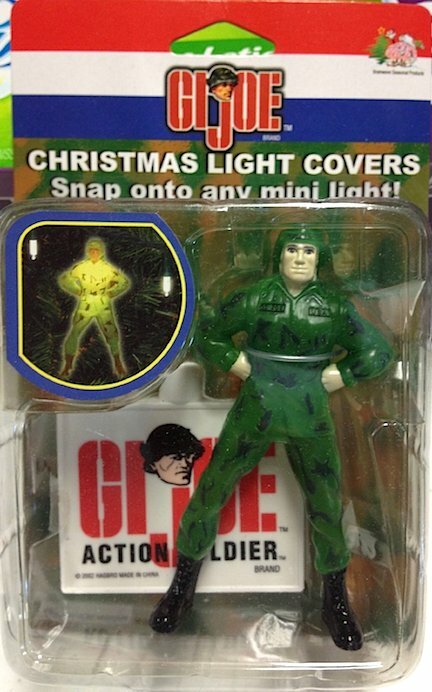 Bottom Line: As GIjOE’s 50th Anniversary year draws to a close, fans are still looking for something…ANYTHING, to help them celebrate their favorite action heroes over the holiday season. Except for a very brief showing of 50th commemorative ornaments sold at select Hallmark stores, there has been very little to report. Fortunately, we think we’ve found a fairly cheap solution that could make many Joeheads happy again. Do you remember a set of fairly cheap string-lights created back in 2002 by the now-defunct “Brain-Wave” party-lights company? Well, a LOT of those sets are still around, still unopened, and still unsold. Twelve years after their debut, many unsold sets are now finding their way back onto the secondary market, and the prices are still very reasonable (just $14 to $17 per set, typically). If you’ve never picked one up before, this might be just the thing to raise your “Joe Spirits” this Christmas. They can be used to decorate a space in your office, light up a Christmas tree or even provide some vintage logo illumination for a “Joe Room” display case. Remember, they’re available two ways: as a 10-piece set (see photo above) and in small “light cover” 2-packs (see photo at right). We did a quick search and found both versions for sale over on ebay (today), but as with all GIjOE-related product-hunts, patience and persistence are watch-words to live by. Good luck and Best Wishes! 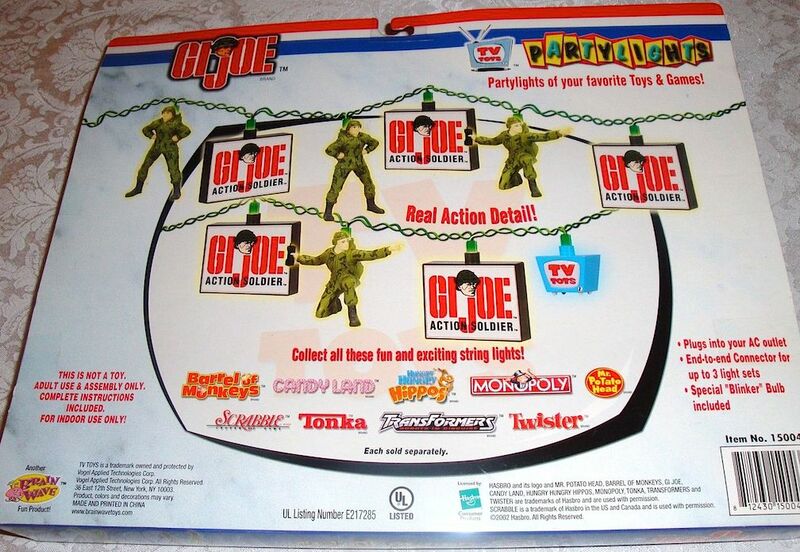 The back panel of the package reveals how the GIjOE lights look once they’re strung together and lists other toy brands that Brain Wave produced. Pretty cool! (Photo: ebay) Click to enlarge.